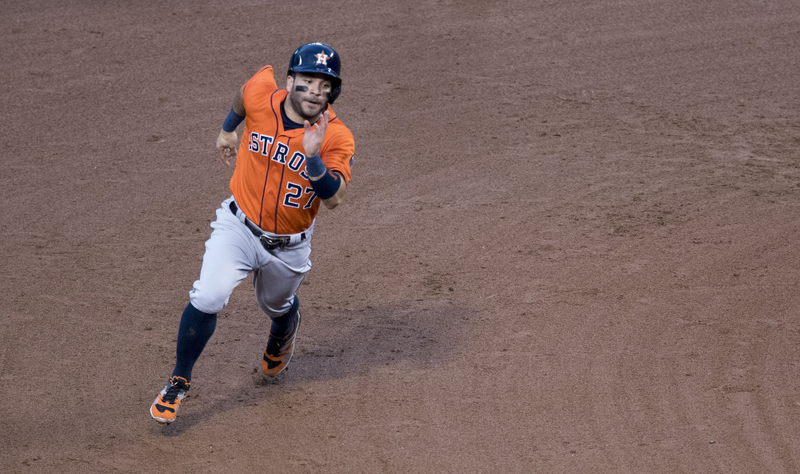 The existence of Jose Altuve illustrates the difference between the improbable and the impossible. Welcome to the fourth installment of this year’s Trade Value series; you can find links to the previous three posts above. If you’re not familiar with this project, there’s an explanation of the process in the HM post, so that’s the best place to start. Now let’s turn our attention to today’s 10 players. If Jon Gray pitched in any other stadium in baseball, he’d probably be considered one of the game’s best young hurlers by now. With premium velocity and a very good slider, he profiles as a guy who can miss bats and manage contact well enough, and if his command takes a step forward, there’s ace potential here. With four years of control remaining, and traditional stats that won’t let him get big arbitration raises, Gray is going to be a bargain for a while. He might not have the recognition of some of the other hurlers on this list, but if he got traded out of Colorado, that would change quickly. The Rockies know what they have, though, and they’ll happily keep him instead. Elite strikeout rates, elite ground-ball rates, and now he’s giving up some of the weakest contact in the league too? On a per-innings basis, there are few pitchers in baseball better than Lance McCullers. But quantity of innings remains a bit of a concern. McCullers was limited to just 14 starts last year due to problems with both his shoulder and elbow. He’s made 16 starts so far this year, but the Astros have been aggressive at getting him out of games early, as he’s averaging just 23 batters faced per start. Given his history of arm problems, he’s probably never going to be that 200-inning workhorse whom everyone covets. As dominant as McCullers can be, though, there’s still a lot of value in getting 160 or 170 high-impact innings, especially if it keeps him healthy for the postseason. The Astros know there’s no real reason to push his workload right now, given their large lead, and his only DL stint this year looked more like a rest period than a serious injury. So, with four years of control after this one, there would be a number of teams lining up to acquire McCullers, health risks and all. Lance McCullers + Track Record = Carlos Carrasco. The paragraphs I wrote above for McCullers basically hold true here. On a per-innings basis, Carrasco is elite, but you’re not getting 200 innings a year from him; you might not ever get 200 innings from him, in fact. But as long as you accept that there are going to be some skipped starts and a managed workload, Carrasco is still one of the best arms around, and his decision to ask the Indians for a guaranteed contract means that he’s one of the cheapest frontline starters around. He’s under contract for just two more guaranteed years, and if his arm holds up, Cleveland has team options 2020 and 2021, as well, giving them the ideal combination of long-term potential without any significant risk. The trouble with breakout stars is that you can’t really be entirely sure that a breakout is going to last. Last year, Yelich showed every sign of taking steps towards sustained improvement, finally getting the ball off the ground and tapping into some power to make a legitimate offensive force. But to this point in 2017, the power hasn’t yet carried over, and to make matters worse, he’s now running the lowest BABIP of his career. Instead of building off his 2016 season, Yelich has taken a bit of a step back, and again putting his ultimate offensive value into question. But it’s also important to look at the big picture here. This is a 25-year-old up-the-middle player with a career 119 wRC+ and excellent baserunning abilities. Yelich hasn’t become Joey Votto yet, and I know he feels kind of disappointing in some ways, but it says something about our expectations that a guy averaging +3.5 WAR per season from age 21-25 could be considered anything but a success. He might not ever be any better than this. Last year’s breakout could have just been a career year. But even if this is all Yelich is, well, this is still a really good player, with five more years of team control after this, at prices that buy you a mediocre platoon guy these days. And if he ever does consistently tap into his power, then Yelich would instantly become one of the most valuable pieces in any organization. In some ways, Benintendi is similar to Yelich. He’s playing corner outfield now, though he probably could handle center field and might shift positions depending on how the Red Sox construct their roster for the long haul. He doesn’t have the kind of power you generally expect in a corner outfielder, but he controls the strike zone well, and there’s room to add more power as he gets older. Just 22, he’d still be a useful big leaguer even without any improvement, but he’s young enough that it’s not hard to imagine some more growth is coming. A team looking to maximize present value probably wouldn’t win the bidding war for Benintendi, but his combination of being able to play everyday now while also providing long-term value would be appealing to any team looking to win in the near future. That said, there are a number of “he’ll grow into his power” guys floating around MLB who just never did. And it’s not like Benintendi is hitting a bunch of doubles that you can easily just extrapolate into home runs; nearly half (12 of 26) of his extra-base hits this year have gone over the wall. And Benintendi isn’t exactly the biggest guy in the world, nor is he hitting the ball all that hard as of yet. There’s enough present and future value here for teams to still consider him an organizational building block, but I will admit to now harboring a bit of skepticism about his eventual upside. I wouldn’t be terribly shocked if he fell off this list next year, in fact. While some guy in New York has overshadowed every other young slugger in the first half, Sano has been pretty impressive in his own right, re-establishing himself as one of the best young hitters in baseball. On average, he hits the ball harder than anyone else in baseball besides that monster in the Bronx. The move back to third base has also been beneficial, as his physical skills work a lot better there than in the outfield. He’s probably never going to win a Gold Glove, but he can handle third base for now, and with his power, he’s become one of the better third baseman in the game. A 24-year-old elite slugger with four years of team control remaining is the kind of building block about which teams dream. While the Twins still need a few more pieces to fall into place before they become legitimate contenders, they’ve found their cleanup hitter for years to come. Once just a fun curiosity, Altuve has become a legitimate contender for the title of best non-Trout hitter in the American League, and even though this has been the case for a few years, it’s still amazing. In 2013, he slugged just .363 and only had 38 extra-base hits in 672 plate appearances. He has 40 extra-base hits already this season and is slugging .551, the kind of numbers that used to be reserved for guys who looked like Miguel Sano. But the 5-foot-6 Altuve is now a legitimate power threat, and his remarkable strike-zone control didn’t suffer in the development. Because Altuve signed an early-career extension back when he didn’t have any power, the Astros have a pair of team options that they can exercise for the next two years, and those options will pay him a grand total of $12.5 million. Total, not per season. The remainder of Altuve’s deal pays him as if he were something like Matt Joyce. Instead, he’s something like the prime version of Craig Biggio. Altuve’s development into a legitimate superstar is one of the main reasons the Astros are a behemoth. Speaking of guys who signed their long-term extension just a little too early, Goldschmidt has two years left on the deal he signed before the 2013 season, back when he was a 24-year-old coming off a good-not-great first season as a major leaguer. As a former eighth-round pick who wasn’t considered much of a prospect on his way to the big leagues, it’s easy to understand why $32 million in guaranteed money was too difficult to pass up. Had he not signed the deal, however, he’d be a free agent at the end of this season and would probably be looking at a long-term deal between $200 and $300 million. Instead, he’ll make $25 million over the next two years, and hope the market still likes him in a few years, when he’s selling his age-32-and-beyond years. But that’s hindsight. No one knew Goldschmidt was going to turn into this. He’s gone from an interesting late-bloomer into the best all-around first baseman in the game, and he basically has no flaws. He walks, he makes contact, he hits for power, he runs the bases very well, and he’s an excellent defender at his position. While the team’s pitching has been the biggest difference between last year and this year, the biggest reason the Diamondbacks are ever in contention is their franchise first baseman. For me, Michael Fulmer has been the surprise of this year’s project. I knew he had a strong rookie season, but I also knew that it was based in large part on a low BABIP that didn’t look sustainable. I knew he was having a good sophomore year, as well, but that his strikeout rate had actually gone backwards and that, once again, he was succeeding by limiting hits on balls in play. The strikes-and-grounders approach can certainly work, but when thinking about the best young pitchers in baseball, I generally didn’t put Fulmer in that category. But ZIPS obviously loves him, despite the lack of strikeouts, which is pretty interesting. And as I asked people in baseball about him, the responses were almost unanimously positive. Jose Quintana with better stuff. What Sonny Gray was a couple of years ago. Zack Greinke’s name even came up, referencing a guy who figured out how to strike batters out later in his career, as a reason to not care too much about Fulmer’s current whiff rates. The general consensus I got was that this is the type of guy on whom FIP-style metrics will miss the most. And unlike last year, the Statcast data actually supports the notion that Fulmer is the primary reason why hitters aren’t doing anything when they make contact against him: his .287 xwOBA is not far off his .275 wOBA allowed. Fulmer gets a lot of weak grounders, so even though he’s not missing bats, he’s creating outs. So, yeah, Michael Fulmer. He’s not a household name yet, but he does indeed look like one of the best young starting pitchers in baseball. And with five years of control remaining, the Tigers have the thing every contender wants: a cheap young frontline starter who isn’t going anywhere any time soon. Before this year, it was kind of easy to take Chris Sale for granted. He was really good, but there was that Kershaw guy, so he was never the best left-handed pitcher in baseball. He mostly didn’t pitch on winning teams, so we never saw him on the big stage in October. But in an era when pitchers are regularly breaking down and in which a home-run spike has transformed some formerly good pitchers into batting-practice machines, Sale is now better than ever. And considering he’s finished in the top six in Cy Young voting for five consecutive years, that’s saying something. Barring a second-half collapse, he’ll win his first trophy this year. And deservedly so, as his numbers are just insane. The Red Sox paid a steep price to land Sale this winter, but so far, he’s making them look wise for not backing down in a bidding war. It’s hard to find pitchers who have this kind of impact on a team; to get one for three years at bargain rates is incredibly valuable. We hoped you liked reading 2017 Trade Value: #21 to #30 by Dave Cameron! I feel like Fullmer should be ranked higher than he is. If Dave had done a Tier system, I think there is an obvious divide between Fulmer and guys immediately after him in terms of control (Altuve, Goldy) or quality (Benintendi, Sano).